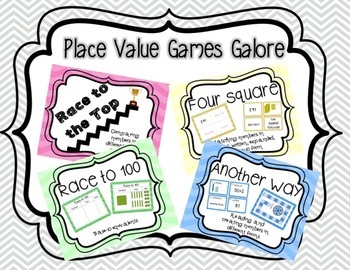 This is a set of 4 Place Value Games to help your students with standard, expanded, written, and base-10 form for numbers in the tens, hundreds, and thousands. The games are easy to set up and play! Easy directions, recording sheets, and answer keys are included. This prints well in grayscale. 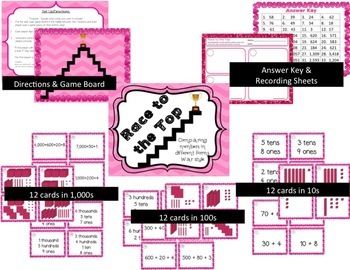 Race to the Top: In this war-style game, students move up the ladder game board to reach the trophy by determining the value of numbers shown in different formats. 12 cards are numbers in the tens, 12 cards are numbers in the hundreds, and 12 cards are numbers in the thousands. Within each set of cards, 4 are number word (3 tens 7 ones), 4 are expanded, and 4 are base-10. 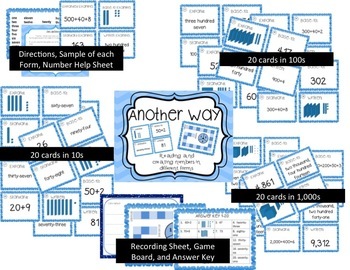 36 total game cards, with easy directions, answer key, and a recording sheet! Another Way: In this game, students move around a game board by giving the number shown in the format stated. Numbers are shown and asked for in expanded, written, base-10. For example, a number might be shown in expanded and the student is asked to give it in base-10. 25 cards are numbers in the tens, 25 cards are numbers in the hundreds, and 25 cards are numbers in the thousands, for a total of 75 cards! A written number guide, form guide, recording sheet, answer key, and game board is included! 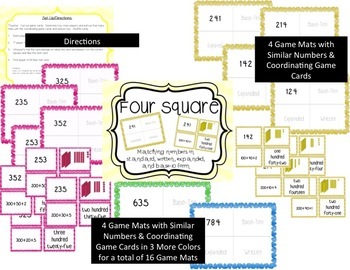 Four Square: In this game, students compete against each other to fill their four square mat with a matching set of standard, expanded, written, and base-10 form. To make this game more challenging, the numbers are similar. For example, the target numbers might be 238, 283, 328, and 382. There are 4 sets of 4. Each set contains 4 game boards with similar target numbers and the 16 coordinating cards. An answer key is included for each of the 4 sets. Race to 100: This game focuses on students understanding equivalents (how many ones in a ten, how many tens in one hundred). There are directions for the Race to 100 version and students could easily play Race to 1,000. A student sorting map for their base-10 pieces is included, as well as a blank version. Follow me! My followers get email notification of limited time freebies ! Please leave feedback and earn TPT credit to spend! To see what other products I have, visit my TPT store!